Army Sgt. Russell M. Durgin - Run for the Fallen New Hampshire, Inc.
﻿23, of Henniker, ﻿NH; killed in action when his unit took small arms fire in Korengel, Afghanistan. Russell was born 7/2/82, 10 minutes before his twin Sean. He gave a preview of the smiles which would mark the next 23 years plus as he was placed in my arms. Good natured, loving, always ready with a joke or prank, but was also ready to help anyone who needed him. While at John Stark Regional High School, Russ played lacrosse, worked on personal fitness and readied himself to join the military. He enlisted in the Army reserves while a junior and attended basic training at Ft. Leonard, MO before his senior year, graduating in 2001. He continued his reserve obligations until 9/11/01 when he was activated and served at Ft. Devens, MA for several months. Upon return, exclaimed "that is not how he wanted to serve" and asked to be allowed to become full-time active Army. He graduated from infantry training at Fort Benning, GA in 2002 and was then assigned to serve a year in the DMZ, S. Korea. Upon return to the US in August 2003, he was assigned to Ft. Drum, NY. Within weeks he was on his way to Iraq with his new unit. He became a welcome addition to this group as told by his fellow soldiers and leaders. His marksmanship, his ability to inspire and keep spirits high were a plus as he made his mark with his new "brothers". Russ learned the reality of war, seeing death and destruction on both sides of the conflict. He struggled with the pictures of bodies of children and families on the streets of Iraq. He felt the brush of death himself on several occasions and I recall him telling me, "who will tell my mom?". In July of that year, his unit came under mortar attack and the camp that they had built was completely destroyed, leaving several wounded and two of his "brothers" dead. Russ returned home September 2004 and continued to be assigned to Ft. Drum. Although he had re-enlisted prior to the July attack and had been promised a transfer to the 82nd Airborne, he asked to remain with the 1-32nd, feeling a need to be with these men with whom he had shared so much. Although the smiles remained, they were softened by the sadness in his eyes, forever changed. He continued specialty training and became a sniper leader. During that year he became engaged, planned to enter law enforcement when he was out of the military and looked forward to settling down and having a family. He left for Afghanistan on March 1, 2006. He was killed June 13, 2006 on a mountain in the Korengal Valley. When his group was attacked he sent his men on and he diverted fire away to protect them. The words that came from his men and leaders included: "he was a model sniper, leader and man, he routinely performed acts of bravery while hunting down the enemy. (Lt. Col. Cavoli). "Under the worst of circumstances , he'd have a smile on his face, unflappable with the ability to make decisions under extreme conditions." (SSgt Lightner). "There are American soldiers still alive in the Chosin Battalion because of his bravery and heroism on the battlefield in the Korengal Valley." (Carabello). Russell is survived by his parents, Jean and Lester L. Durgin; his twin brother, Sean L. Durgin; three additional brothers, Frank Tully, Greg Tully, and Keith Durgin; his sister, Ann Tully Kenney and her husband, Michael Kenney; his fiance, Michele Dougherty and a large extended family. 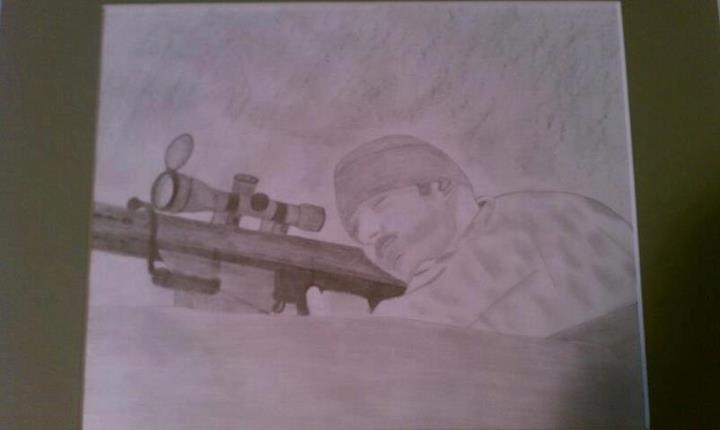 A friend of the Durgin family sketched this picture of Russ (below) from the photo above. BAGRAM AIRFIELD, Afghanistan – Soldiers, sailors, airmen, Marines, coalition partners and Afghan allies lined the main road through Bagram Airfield and flight line June 15 in solemn tribute to a fallen brother in arms. Allied leaders and service members snapped to attention as the casket bearing Sgt. Russell M. Durgin proceeded from the Joint Logistics Center to the C-130 airplane slated to fly him home. Durgin, a sniper team leader with Headquarters and Headquarters Company, 1st Battalion, 32nd Infantry Regiment, Task Force Spartan, died June 13 as his sniper team battled insurgents in the Korengal Valley of northeastern Afghanistan. The Henniker, N.H., native died a month before his 24th birthday. Durgin’s entire Regional Command East chain of command assembled at Bagram to pay the fallen sniper final respects. Maj. Gen. Benjamin C. Freakley, Combined Joint Task Force-76 commander, and Command Sgt. Maj. Ralph C. Borja, CJTF-76 command sergeant major, attended alongside Col. John Nicholson, Task Force Spartan commander, and Command Sgt. Maj. James Redmore, task force command sergeant major. Lt. Col. Chris Cavoli, 1-32 Infantry commander, and Command Sgt. Maj. Jimmy Carabello, Chosin Battalion command sergeant major, headed a delegation including most of Durgin’s leaders, Soldiers and closest friends. Leaders and fellow Spartans described Durgin as model sniper, leader and man. “Sgt. Durgin lived the Warrior Ethos,” Cavoli said. “He never quit, and he always put the mission first. In what is probably the most difficult part of our (area of responsibility), he routinely performed acts of bravery while hunting down the enemy. Staff Sgt. Richard F. Lightner, sniper section leader, served alongside Durgin since November 2003 and accompanied him during an Operation Iraqi Freedom rotation. He described Durgin as an irrepressible personality as well as an outstanding infantryman. “Under the worst circumstances, he’d have a smile on his face,” he recalled. “That’s the kind of guy he was.” Lightner described Durgin as unflappable, praising his “ability to make decisions under extreme circumstances” as well as his technical and tactical skills. “There’s no question he contributed heavily to our success here,” added Master Sgt. Kenneth Leslie, 3rd Brigade Special Troops Battalion operations noncommissioned officer. Durgin’s Soldiers thought as highly of him as his leaders did. Spec. Cesar Cuellar, a sniper on Durgin’s team, described his leader as an amiable, optimistic handyman with a lively sense of humor and a penchant for health, fitness and bodybuilding. 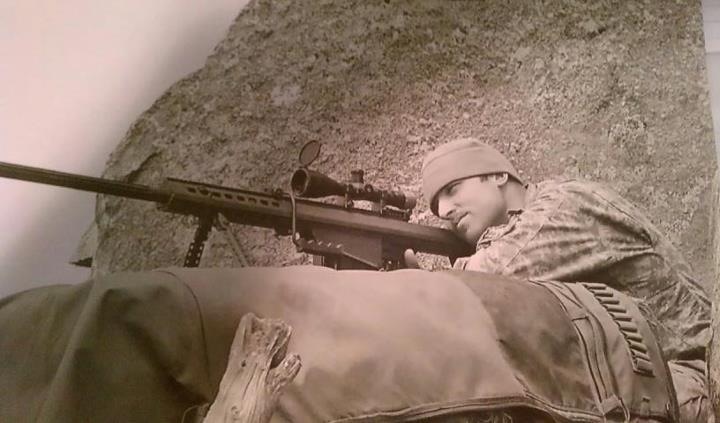 The burly 6-foot, 1-inch sniper greeted Soldiers with banter, jokes and impressions of “Saturday Night Live” skits on many early mornings in the mountains of eastern Afghanistan. “He was a good leader,” Cuellar recalled. “He wasn’t about yelling or trying to humiliate you. He’d tell you what was wrong and how to fix something face to face. “When all the other NCOs were huddled together, he’d come and talk to the ‘Joes,’” he added. Cuellar said Durgin looked forward to marriage, construction work and a career in New Hampshire law enforcement after the Army. Durgin’s amiability extended to Afghan National Army allies as well as Americans. Soldiers saw Durgin’s business side as well. Durgin’s leadership touched some of his Soldiers’ lives profoundly. “Sgt. Durgin was an awesome leader,” said Pfc. Ryan Woodring, another sniper. “He did everything to a ‘T,’ textbook. He took me under his wing and taught me everything. Durgin’s sacrifice, skill, leadership and friendship left indelible marks on his section, company and battalion. “There are American Soldiers still alive in the Chosin Battalion because of his bravery and heroism on the battlefield in the Korengal Valley,” Carabello said. “There should be a picture of Sgt. Durgin next to the NCO Creed,” he added.